As a parent, one thing you quickly learn is that your child will catch you off-guard in one way or another. Unfortunately, many times it will include scary situations where you are not too sure what to do. Among the most common involves dental emergencies. In fact, it is estimated that 50% of children will experience some type of injury to a tooth during their childhood. This could involve a broken or knocked out tooth, sudden toothache, or another unplanned issue. 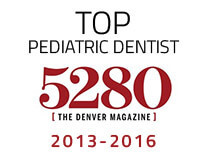 When the unexpected happens, you need a children’s emergency dentist in Castle Rock to help you during the difficult times. Anyone can suffer from a dental emergency, no matter their age. However, children tend to be more prone to them than adults. Although they can occur for many reasons, they often are the result of a sports-related injury, which accounts for as much as 39% of all dental emergencies. In addition, untreated tooth decay is another leading cause with roughly 42% of children having at least one cavity. Both are preventable emergencies with a mouthguard and regular dental care. However, not all can be avoided, such as a sudden fall or accident. When the unexpected happens, don’t panic. Your child needs to see their dentist right away because time is of the highest importance to save their tooth. 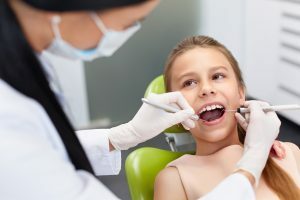 While you wait for the appointment, there are several things you can do at home to help save your child’s tooth while relieving their discomfort. Knocked Out Tooth: Hold the tooth by the crown and rinse it with water. Do not use soaps, cleaners, or dry it. Try to insert it back into the socket. If you are not successful, place it in a cup of milk or water. Dislodged Tooth: Gently try to push it back into position and have them bite on a piece of gauze to prevent it from moving. Chipped Tooth: Avoid having them chew on the tooth and keep it clean. Use over-the-counter pain relievers and cold compresses to manage their pain. Sudden Toothache: A severe toothache is often a sign of an infection or cavity. Keep the tooth clean and do not let them chew on it. Pain relievers and cold compresses can help with the discomfort. Lost Restoration: If a filling or crown comes loose, keep the tooth clean and have them avoid chewing on it until after it has been treated. If your child has an unexpected dental emergency, you need to call your dentist right away for a same-day appointment. With fast care, you will help to save their tooth from needing to be extracted. Dr. Layne Benzley not only completed his D.D.S degree, but also received his pediatric dental specialty certificate from the Eastman Dental Center at the University of Rochester. He caters to the unique needs of children to promote healthy, beautiful smiles. 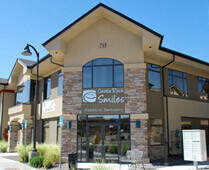 If you are facing a dental emergency, contact Castle Rock Smiles right away to speak with him.